This was an exciting week! I just shipped a couple of boxes to Amazon, containing the first copies of Jews in Berlin, a book of 750 years of history Jewish life in Berlin, with an update on Jewish life today, from the Chabad Lubavitchers to the gay scene of Tel Aviv. I live near Times Square, and the nearest UPS station is in the basement of the Toys‘R'Us on Times Square. So, I borrowed a cart (from our maintenance staff), loaded it with boxes and pushed it through the throngs of tourists towards what is supposed to be the world's biggest toy store. Well, it sure is the fullest! After I unloaded the cart, a guy in a uniform and with a walkie talkie alerted another guy in a uniform with a walkie talkie to let me and my push cart out at a special, tourist-free door. It made me feel like a part of the working crowd on Times Square, and very special indeed. 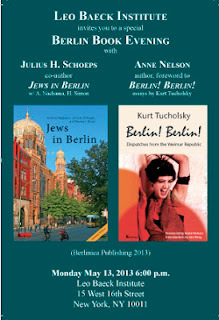 Jews in Berlin will also be available at Barnes & Noble in the next few days. However, if you want the book discounted, and hand-delivered by the publisher, and with a fancy gift bag, courtesy of Berlin Partners, come to the Leo Baeck Institute, 15 West 16th Street, Manhattan, NY, on May 13, 6pm. There is a small fee at the door, but you will get a free glass of wine and real German chocolate. Julius H. Schoeps, one of the authors of Jews in Berlin and knowledgable just about everything, will speak. Also Berlin! Berlin! will be presented at the Leo Baeck Institute, a story collection by Kurt Tucholsky about his hometown, never before translated into English or published in the United States. Anne Nelson, who wrote the foreword, will speak as well. Berlin! Berlin! will be available in a few days as a softcover, the hardcover will follow suit (as a tiny, tiny publisher I don't know the exact day when the mighty Gods of the Amazon will put it up). The hardcover has a dust jacket and a gold stamped spine. I recommend it dearly as a gift for everybody who loves Berlin.